Surprisingly, the NIR technology has been around for more than 30 years, mainly utilized in the agricultural industries. Laboratory Spectroscopy has been used for analysis of organic and inorganic compounds and in-depth studies for online sensors measuring liquors. However, low maintenance, cost effective instrument technology to continuously monitor liquor composition at key locations in Kraft processes have not been readily available. The most practical work in NIR Spectroscopy development has been conducted at the Auburn University Pulp and Paper Research and Educational Center in Auburn, Alabama, USA. The NIR spectral region is defined as the band of wavelengths from 750 to 2500 nm. The quantitative analysis begins with acquiring a spectrum of a sample using a number of wavelengths within this range. Figure on the right shows a typical Transmission Cell arrangement for analyzing liquid samples such as white, green and/or black liquors. This part of the analysis takes 15 seconds. It is critical that the construction materials meet the harsh process environment that is present; therefore all metal parts are made of titanium and the lenses are sapphire. The spectrum is linearized using the Beer-Lambert relation. Extraction of data is done utilizing Partial Least Square Regression (PLSR) technique. Using spectral data measured from samples with known properties (e.g. EA, AA, TTA etc.) a regression model is built. This regression model is then compared to spectra from unknown samples to measure the chemical/physical properties of the unknown sample. Even though the NIR technology had shown much promise at several industrial installations, no commercially viable, cost effective analyzer has been available until recently. 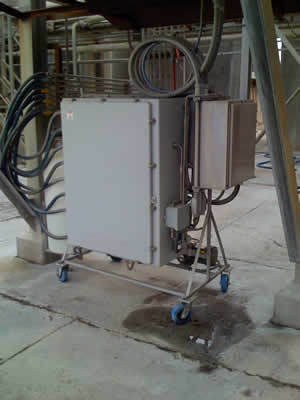 Some of the critical issues include: the ability to collect samples that are under process pressure and/or atmospheric pressure, keeping the sampling lines from either plugging with solid particles (mud, chips, fibers) or scaling up due to liquors. At the analyzer: sampling valves must meet the requirements of being leak-proof against slurry and/or high pressure while optics are kept clean by periodic and automatic acid cleaning followed by a self-calibration cycle. These sampling related problems along with spectrometer robustness issues have been resolved with a physically small, semi portable, environmentally self contained and fully automated analyzer package. A commercial version is now available for white, green and black liquor analysis at key measurement locations in the Kraft process. Chemical composition of process liquors is determined through the use of near-infrared (NIR) spectroscopy. This spectroscopic technique is a subset of a larger class of analytical techniques that fall in the category of optical spectroscopy techniques. The following figure shows the electromagnetic spectrum with the portion relating to optical spectroscopy expanded. Optical spectroscopy techniques have been used quite successfully for decades in the laboratory setting to analyze liquids, solids and gases composed of a multitude of chemical species. In the past twenty five years the development of miniaturized and durable electronic and optical components have allowed many of these techniques to be moved from the laboratory setting to the process environment. Development of new computational techniques along with the microcomputers to implement them have further advanced the use of spectroscopic techniques for both qualitative and quantitative analysis at the process.